For teaching assistants, the competition is fierce. There are hoards of unemployed teachers out there, banging at the gates. How can you stand out from them and get more interviews? 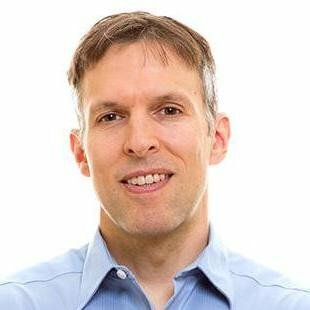 How can you make life easy on yourself and get a top-tier teacher's assistant job fast? It's simple: Write a teacher assistant resume that stands above the throng. It doesn't take a ton of work. You just need to show your best achievements that fit the job. A teaching assistant resume example better than 9 out of 10 other resumes. How to write a teacher assistant resume that gets more interviews. Tips and examples of how to put skills and achievements on a teacher’s aide resume. How to describe your experience on a resume for teaching assistants to get any job you want. 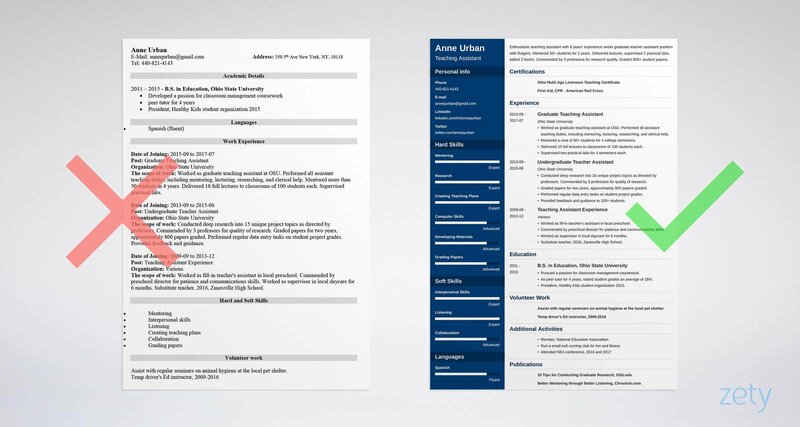 Here's a sample resume for a teaching assistant using our resume builder. Teaching Assistant Resume Example - See 20+ resume templates and create your resume here. What's the Best Format for a Teaching Assistant Resume? Picture a principal. His name's Ed. He's got a mean combover and a coffee mug that says, "I make education in my sleep." He's also got a bitter dislike for sloppy work. The best teacher assistant resume format is pleasing to Ed's eye. It gives the info he needs fast, without a lot of squinting. So, use the reverse-chronological format. It puts your most recent achievements first. 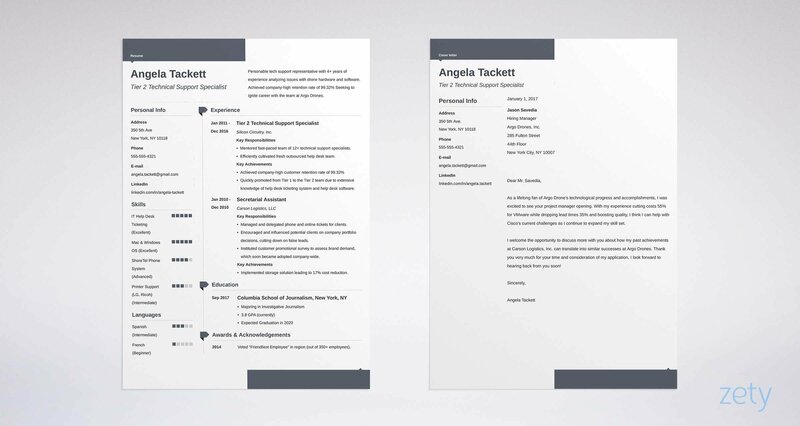 Use clear, clean resume fonts, big headings, and just the right amount of white space to give the eyes a coffee break. Last, save your work as a PDF, so it doesn't flunk in transit. PDF resumes preserve their formatting. Word documents can change shape once you send them. That goes for teacher's aide resumes too. Pro Tip: Using a teaching assistant resume PDF? Check the job description first to make sure they're not off limits. Some offers play favoritism with resumes in PDF and Word. "Hm. I'd better read this carefully." You need to make the hiring manager say the words above. That's because most managers skim resumes and then discard them. So, kick off with a teaching assistant resume summary or resume objective. A resume summary is for anyone with locker bays of experience. A resume objective is for work history as empty as a classroom on a snow day. The first of our teacher's assistant resume samples lacks measurable achievements. Experienced teacher assistant with 6+ years of experience. Highly skilled in mentoring, delivering lectures, supervising practical labs, and doing research. Can edit academic books and grade papers. That's not F-minus work. But be honest: Will it impress the hiring manager, or make him skim the rest? Enthusiastic teaching assistant with 8 years of experience. Seeking graduate teacher assistant position at Rutgers. Mentored 50+ students for 2 years. Delivered lectures, supervised 2 practical labs, edited 2 books. Commended by 3 professors for research quality. Graded 800+ student papers. Skilled in research and materials development. Wow. Move to the head of the class, because the professor is picking up the phone to call you for an interview. But what if your work history looks more like a freshly-washed whiteboard? You may be tempted to write an old-style resume objective. Before you do, see the next two TA / teacher's aide resume examples below. Without experience, the experts used to say a resume objective was the way to go. That basically says, "I'm passionate, hard-working, skilled, and I want you to hire me." To quote Scotty in Star Trek IV, "How quaint." It's a far, far better thing to convince them why they want to hire you. Look how that happens in these two TA / teacher aide resume examples. Entry-level teacher’s aide. Haven't yet worked professionally, but I have an extremely strong work ethic! That resume objective has "remedial" written all over it. Unless your mom is best friends with the hiring manager, you won't stand out. Energetic teaching assistant, seeking position with Sunnyside Preschool. Worked as fill-in TA at NRGLC Preschool. Commended by director for solid patience. Supervised at Cheery Faces Daycare for six months. Worked as substitute teacher at Zanesville High in 2016. The school's hiring manager just put down her inspirational-sayings desk calendar. She's looking for your phone number. Pro Tip: A teaching assistant resume objective for a graduate TA looks different from an undergrad, preschool, or daycare TA resume. Fit your achievements to the job offer. If you had experience, you'd be writing a resume for a teacher position. You've almost certainly got more experience than you think, or you can get some fast. You just need to show it right to wake the hiring manager like a fire drill. List your most recent job first. Add 3-5 bullet points with measurable accomplishments. Make sure they match the job requirements, like in the graduate teacher assistant resume examples below. These sample teaching assistant resume experience sections are for a job that values mentoring, lecturing, and developing new course materials. Worked as graduate teaching assistant at OSU. Mentored a core of 50+ students for 4 college semesters. Delivered 10 full lectures to classrooms of 100 students each. Assisted in the development of new course material. Edited two books. That stands out like a "Hang in There" kitten posters. But lose the accomplishments, and you get the next of our senior teaching assistant resume examples. Worked as graduate teaching assistant. Taught several lectures on my own. Eek, right? Like the school library during summer break. Deserted. You need achievements to get noticed. But what if you don't have them? See these next entry-level teacher aide resume examples. Don't have teaching assistant experience? That doesn't mean you don't have teaching assistant resume experience. Does that sound like Master Sifu from Kung Fu Panda? Lots of jobs build teacher's assistant experience. Worked as a substitute teacher? Held any job in education? The junior teacher aide resume examples below show how to use that kind of history. Teaching Assistant Experience: I haven't yet worked as a professional TA. Worked as fill-in teacher's assistant in preschool. Commended by preschool director for patience and communications skills. Worked as supervisor in local daycare for 6 months. Substitute teacher, 2016, Zanesville High School. You just blew the curve out. But all it takes is a little head scratching to build a teacher assistant or teacher aide resume like that. Pro Tip: Looking for a job as an elementary school teaching assistant? Start subbing. You'll learn a ton about the different classes, and your networking will benefit. You don't need a degree to be a teacher's assistant. But you do need relevant coursework. But then inform it with accomplishments. Let's say our TA job description values classroom management, tutoring, and leadership. These two professional teacher assistant resume examples handle that in very different ways. Pursued a passion for classroom management coursework. As peer tutor for 4 years, raised student grades an average of 18%. President, Healthy Kids student organization. That's the education resume equivalent of, "I would assess the situation and act accordingly." Pro Tip: You only need two semesters of college for most TA jobs. That said, more looks better on a resume for assistant teachers. She wants to know two things about your teaching assistant skills. First, she wants to know they match the job description. Second, she wants to know you're not just saying what she wants to hear. So, read the job description carefully, and say you've got the skills he asked for. Conducted deep research into 15 unique project topics as directed by professors. Commended by 3 professors for quality of research. Graded papers for two years, approximately 800 papers graded. Performed regular data entry tasks on student project grades for 200 students. There. Your resume for teachers gets an A++. Not sure what skills to list? Start with the sample teacher aide resume skills list below. Don't list all the teaching resume skills below. Just use the ones shown in the job ad, plus a couple more so you're not apple-polishing. This isn't a complete list, so find more in teaching assistant job descriptions online. The best part of the skills above? They make great teacher assistant resume keywords. Use them, and Applicant Tracking Systems will beat a path to your door. Pro Tip: Got skills with the SMART Learning Suite or MS Office? Those look great on a resume for an assistant teacher too. If the hiring manager only knew you, he'd hire you in a heartbeat. So, let him. Add targeted "other" sections to your teacher aide resume. Do it right, and your teach assist resume will jump off the page like someone put a tack on its chair. Pretty hard to deduct points for that. But with a little thought, anyone can have a teaching assistant resume like that. Pro Tip: There's no such thing as overqualified in a resume for an assistant teacher. In fact, willingness to take a lower-tier job can show your work ethic and get you into a full-time teaching job fast. Are you writing a TA or teacher's aide resume for graduate school, preschool, or special education? Each position has very different needs. Take a look at the list below for pointers. Academic achievements matter a lot in a graduate teacher's assistant resume. Pay close attention to the job description. You'll need to show a high grade in the class you'll be TA-ing for. Don't have one? Consider taking it again. A resume for a teacher assistant in undergraduate school is different from a grad school TA resume. Undergrads do a lot of grading, clerical work, and helping students. Include experience like tutoring, data entry, and volunteering in your college teacher's assistant resume. Writing an elementary school teacher assistant or teacher's aide resume? Show when you've worked with kids. An education degree and/or a teacher certification can add a lot of value too. You may need to prove classroom management skills. A preschool assistant teacher resume should show work with children. Include volunteering with youth groups, daycare work, nannying, and any relevant certifications. Child education coursework is a big plus. Even babysitting can boost your interview potential. A daycare resume for teacher assistants is similar to a preschool TA resume. Mention First Aid and CPR certifications as well as any work you've done with kids. Classroom management skills are critical. Special education resumes for assistant teachers should prove patience, experience working with special needs students, and related training. Certification as a special ed teacher is a plus. So is a bachelor's degree in special ed or general education. Pro Tip: Don't just write an elementary school or college teaching assistant resume. Write a resume that targets each job you apply to. How About a Teaching Assistant Cover Letter? Q: Do you need a teacher assistant cover letter for your resume? Q: So why do so many experts say to skip the cover letter? A: Because most cover letters are just an extra sheet of paper. So, don't write a "blah blah" cover letter. Write one that makes the hiring manager say, "Interesting... I'd better pay special attention to this teacher’s aide’s resume." First, make it personal. Use the manager's name and show you understand his needs. Next, prove you can fill those needs by listing your most eye-catching, relevant achievement. I've wanted to work at Jerome Horwitz High School for years. My friends Shane Doherty and Keith Groves speak very highly of the focus on staff development at the school. I believe my strong work ethic and thirst for the continual development make me an ideal fit for this position. Close with a request. "I'd welcome the chance to talk with you about providing education excellence" works great. Pro Tip: After you send a cover letter and resume for a teacher assistant, follow up. A follow-up in three days can give your interview hopes another shot. Add contact info near the top of your teacher’s assistant or teacher aide resume. Also, add a LinkedIn address. LinkedIn isn’t just for marketers. Teacher’s aides can benefit too. You’ll need to make a great LinkedIn profile that puts your interview rate through the roof: How To Optimize Your LinkedIn Summary & Profile To Get Jobs. Pro Tip: Don't let that three-day Facebook argument three years ago sink your career, clean up your online presence. To write a great teacher assistant or teacher aide resume, focus on the goal. Form a good idea of what a teacher's assistant is, and what they do in different schools. It helps to know how to become one too. A teaching assistant is just what it sounds like: someone who helps a teacher. In elementary school and high school, that often means teaching special education. In daycare and at the graduate level, TAs may teach classes. You'll generally need to show two years of college coursework on a professional teaching assistant resume. Elementary school TAs can start by subbing. That creates both relevant experience and networking. Most assistants don't require a teaching assistant certification. What Do Teachers’ Assistants Do? Teaching assistant duties and responsibilities vary with the type of school. College TAs may help with grading papers, or with teaching classes. Assisting at the elementary school level may mean teaching special education classes. Writing a resume for a new career outside of the TA world? List teaching assistant accomplishments that match the new position. For a teaching job, include lesson plans and classes taught. If getting into project management, focus on school projects you've completed. Pro Tip: Consider putting your education section first, right after your summary. That's especially true for entry-level resumes for teacher’s aides. Match your bullet points and skills to the job description. A tailored teacher assistant resume will stand out like Albert Einstein in the staff lounge. Add "other" sections that show you're more than just another applicant. They'll give added zip to a resume for a teaching assistant. Put the best measurable achievements from your resume in your resume summary. Make it a short commercial for the rest of your teacher aide resume. Do you have questions on how to write a great resume for a teacher's aide? Not sure how to describe your skills or achievements? Give us a shout in the comments! Let's start the conversation. A complete guide to writing a professional resume for a tutor. 20+ examples and tips from our experts. Use our tutor resume sample.